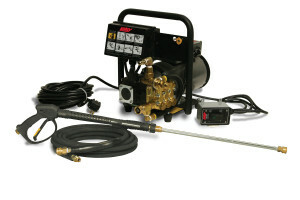 Seattle Pump and Equipment carries top of the line Industrial Cold-Water Pressure Washers! Whether it’s a Hotsy or BE Brand Cold-Water Pressure Washer, you can’t go wrong! All Cold-Water units come with Hose, Wand & Trigger assembly, Chemical Injector and a Set of Nozzles. You will have everything you need to go straight to the job-site or home and fire-up your new investment. Also, the Manufacturer Warranties can’t be beat! Don’t go to your local box store selling cheap throw-away pumps! Come to Seattle Pump and Equipment and invest in a unit that lasts, can be serviced by OUR knowledgable & professional Shop Team and has available parts on the shelf to keep your Pressure Washer in tip-top shape! Powered by a reliable 196cc Honda GX200 gas engine. Powered by a reliable 2.0HP (1 Phase) 110V electric motor. Durable light-weight aluminum frame with anti-vibration rubber foot.